I just had my first competitive runway experience! 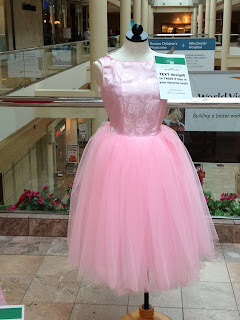 I didn't win, but my dress came out exactly how I wanted and I am very proud of it. Four fashion design students from Framingham State University and four students from Lasell College were chosen to compete against each other in a Design Wars/Project Pink runway show. The show was affiliated with the Ellie Fund, a non-profit organization for breast cancer, so the garments all had to be pink. 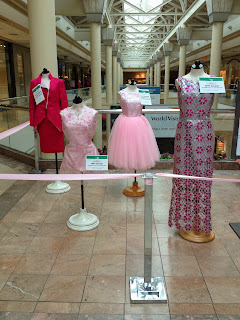 We had a runway show at the Burlington Mall in Burlington, MA and our garments were displayed on dress forms at the mall for two weeks so people could text to vote for their favorite. Our models were selected for us by the Ellie Fund. I really lucked out. My model, Anne, is beautiful, young, thin, and tall (5'9"!!). She was so great about meeting with me like a thousand times for fittings. And she looked absolutely gorgeous walking down the runway. She can work it. Each designer was given $100 to spend on fabric and notions. 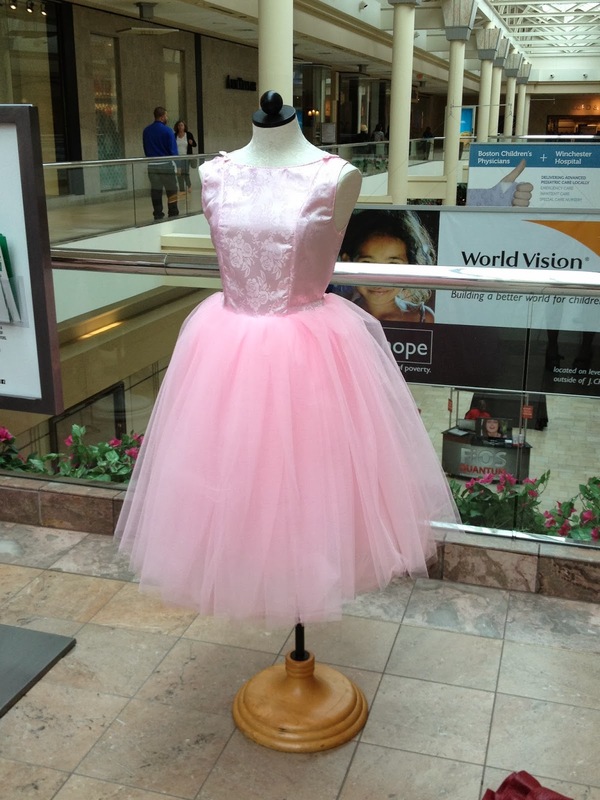 I used 20 yards of 54" wide tulle, doubled. There are two layers of 7 yards and a layer of 6 yards. The tulle actually wasn't as terrible to work with as I expected. I only ran into issues when all the tulle was sewed onto the bodice and I had to try to sew in a lining and a zipper. (I gathered 1.5 yards of taffeta into a dirndl skirt for the lining.) I had to hand sew the lining to the tulle in the seam allowance and I had to sew in the zipper by hand. I'm usually pretty good at sewing invisible zippers, but this one was not my best. For the bodice I used a brocade from Jo-Ann Fabrics. I thought it would be terrible to cut out since the fabric seemed so shifty, but I had no problems. I cut the pieces out with pinking shears so fraying wasn't too much of a problem until the very end when I finished the neckline. I barely had any seam allowance left. We had three weeks to make our garments. I spent 2 weeks and 5 days fitting the bodice - I made four muslins. I originally draped (I'm taking a draping class right now and it's awesome) a two-dart bodice and as things progressed it became clear that the bodice wanted to be princess seamed. So I sewed this whole thing together in two days and finished it the morning of the runway show. It was worth it, though - the dress fit my model perfectly. Like really truly beautifully. We had to do a little interview after the show, which was really traumatic for me. I do not like public speaking. I tend to sweat and cry and stutter. But I kept my composure and I don't think I embarrassed myself too badly. I used single fold bias tape to finish the neckline and armscyes. I folded the bias tape in half after I sewed it into the bodice so that the stitching line would be narrower. I found little pink bows at Jo-Ann Fabrics and thought they were a cute detail. Here were all the entires. 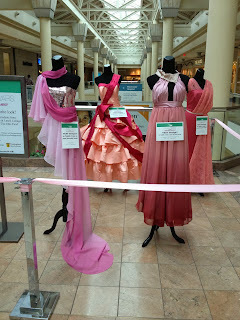 The silver dress in the left picture is the dress from Framingham State University that won second place. The first dress in the right picture is the winning look from Lasell College.